Hereford and Worcester Moths: Wyre Forest - Helen Mackeness reserve. Last Thursday, Myself and Patrick Clement ran four traps on the new WWT reserve in the Wyre. The site is small but varied with damp meadow leading to a steep bank that is quite open woodland on the top. A warm still night produced a good haul of 42 species, of which 12 were micros. While the bulk of the catch consisted of the usual suspects for the location and time of year, one or two were particularly nice to see. 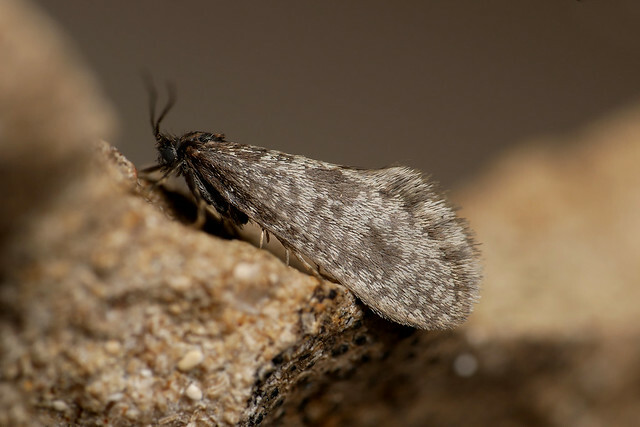 Calybites phasianipennella was only the second record for SO77 and the first for the forest. Dahlica inconspicuella is quite common in the forest but it is quite rare to see the winged male adult of this bagworm. Its triangular cross section larval cases can be found on old fence posts in many parts of the forest. Brindled pug and Lunar Marbled Brown were the most abundant moths of the evening with 86 and 76 individuals counted between the four traps. White Marked can be elusive even in the forest so it was nice to see a couple of examples, even if they are a little worn now at the end of their flight period.